Anne is working as a scullery maid when she becomes pregnant. Too far gone to do much about it she gives birth on the first day of December 1650. The child never drew breath yet Anne is accused of its murder. Sentenced to death by hanging the body of Anne Green is carried away for dissection. But as the physicians begin the procedure a strange rattle is heard from her throat. Could Anne still be alive? I read Fallen Grace not so long ago and then accepted an invite to visit the Bloomsbury offices in London and meet Mary Hooper. I accepted that invite and thought Newes from the Dead, one of Mary’s first historical fiction books, would offer me brilliant company on the three hour, each way, train journey. I was so totally right as I couldn’t put it down at all and very nearly ignored the conductors voice telling us we’d reached our destination! Newes from the Dead is a very powerful story. It is told in both first and third person narrative. The first person narrative is heard in the chapters where we get Anne’s perspective of things. She believes she is dead and is trying to make sense of everything and reflecting on the events which led to her demise. The third person narrative comes when we are watching over Richard, one of the Physicians who is at the dissection. I loved the way the story was told because you got a lot of insight into the events, what is happening when Anne is in her “black place” and you also get a little back story into Richard which I thought was brilliant. The story that Anne goes over, of how she came to be in her situation, is amazing and really keeps you gripped. The entire story is a fantastic portrayal of life in Victorian times and you can really tell that Mary Hooper did her research! What is even more gripping about the story is that its based on an actual account of what happened to one young lady in 1650, and very closely based too. The characters are wonderfully writing and you really come to love them. Anne is a kind hearted, loving type of girl and you really feel sorry for her and her naivety. She got into her situation because of false promises and you know that she didn’t want to do the things she did but she was too bowled over! I loved her and what you found out about her family, I could actually relate to her very well even though Id never been in a situation like that, it was very powerful. Richards character was brilliant too, the story of Anne coming around could have been told a million different ways, with just a general third person narrative but the way it focussed of Richards perception of the events was brilliant and he was such an interesting character to get to know. I loved his stammer and just how cute he was… you could ddefinitely take Richard home to your grandma! The other characters were really well developed too. Mrs Williams, Susan and the servants were interesting. I didn’t like Mrs Williams and Susan much and felt they were unfair to poor Anne but they did show a bit of remorse for Anne so I will let them off! They were never as awful as Sir Thomas or Master Geoffrey though! I could have swung for those characters many a time!! My favourite character of course had to be John Taylor. He was so sweet and kind and knew his place but didn’t mind much that it wasn’t a great one. He was just perfect for Anne and I was so upset when things didn’t go to plan. I wanted them to having a budding relationship!! Newes from the Dead was a wonderfully written, beautiful piece of fiction. It picks you up and whisks you off to 1650 and it taught me things about the time period that I never knew before! I loved every minute of it and although it was heart-wrenching, it was a beautiful story to read. 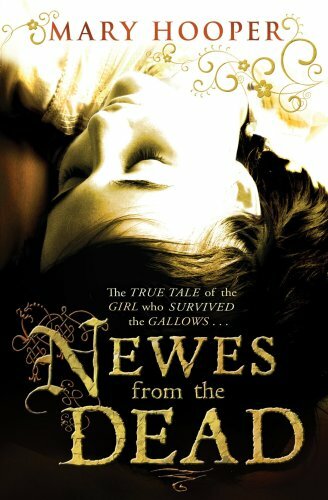 Newes from the Dead was published in 2008 by Definitions, a Random House imprint. Thank you to the wonderful Jade at Ink-scratchers for sending me this book as a birthday gift! Yay! So glad to hear it is fabulous. I must get this one.